On Saturday, I was touring a hospital in Gainsville where college football is happy and people watch TVs and call Him, Timmy. Text messages are no way to watch a football game. The score of the game was 13-7. Excuse the vulgarity, but that's how I experienced Saturday's loss to Illinois. I caught the first 7 minutes of the fourth quarter before turning off my television completely and walking out of the room to meet my boss for dinner and a number of drinks. It's a good thing I had to work all weekend. I'm having difficulty thinking about this game. The first game of my senior year was against Appalachian State. The gravity of that game never really hit me. I remember commenting on the way home, "Well, if they're going to ruin my senior year, they might as well do it the first game of the season." And that's kind of how I felt. The last regular season game I had experienced was The The Game. That was more difficult to handle than App State. We were too close. In retrospect, obviously, App State and all of the problems with 2007 were way more disappointing. The way that team, when healthy, was able to dismantle Florida between its two National Championships showed how much potential that squad really had. 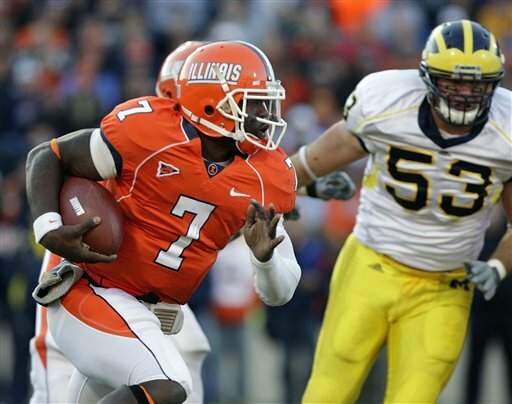 Chad Henne never beat Ohio State; that crushes me. I like Rich Rodriguez. More than you do. From the moment he was hired, I was ecstatic. Through all of last year, I was a huge supporter. After losing to Illinois, I'm still a huge fan. I like Tate Forcier, possibly because I knew Jason when he was at Michigan and always had high hopes for him. I like Junior Hemingway's name and Greg Matthews' studious glasses. Brandon Minor is impossible not to like and Brandon Graham is a humble super star. I like this team. I might even go so far as to say I like this team as much as I liked my 2007 Wolverines, something I never thought would happen. I had four years of Chad Henne and Mike Hart and those were the guys I looked up to and worshipped and still do. It was going to take a squad of no names and upstarts like the one assembled for me to like them as much. Rodriguez is 8-13 at Michigan. And that makes my stomach uneasy. I like him too much. But I was working all weekend and ardently avoiding internet sports providers and news sources. I won't rewatch the Illinois game and provide play breakdowns. It's all too masochistic. The similarities to the basketball team's season continue to expand. Juice Williams is now nothing more than a horrible spectre that will haunt Wolverine dreams and not clunky linebackers. And Michigan stands on the verge of missing a bowl game again. Saturday is Judgement Day. Time to sacrifice a lamb. Win at any cost, you say? The speed option: What went wrong again? The speed option: What went wrong?